Nice location on the edge of old town. 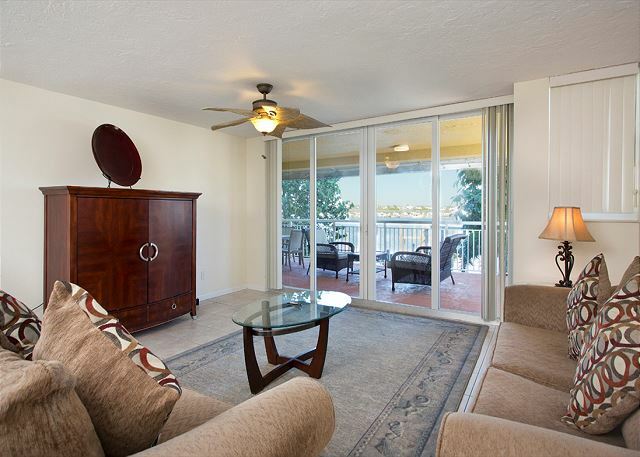 Kitchen is great and laundry is so convenient.very large balcony overlooking the bight. Rugs need replacing as they are quite shabby. Some water damage in bathroom and living room. Beds are old and hard. Nice condo on a marina. Very spacious. Furniture & mattresses could use updating. Kitchen was well stocked with dishes & utensils. Soaps, shampoos, laundry detergent available was a plus. Condo was very clean! Nice rental, walked in and was a little nervous after seeing the walkway, you could see some water damage. But once we opened the door, the unit was extremely nice/clean and a very quiet place to stay. The balcony overlooking the harbor, pool and docks were awesome. Would recommend to others, but hopefully they fix the walkway and remember they want 5 day rentals. Awesome staff, great condo, we had a great time, will be coming back soon!!! This was a perfect pick. Beautiful view from the large balcony. We were within walking distance of Duval St plus the convenience of several grocery stores and shops. The building itself had a little damage to the roof from the hurricane but our unit was in great condition. We would definitely recommend Pelican Landing. The unit had a good view and was very clean. It wasn't very convenient to the usual tourist attractions, but Uber is quick & easy. My only real complaint is the dryer was making a loud, terrible noise and though I reported it to the office it was never looked at during our stay. The beds were comfortable, but the dining chairs and bar stools were a bit beat up & stained. Overall it was a good stay & the pool was great! Great location on the water. Pictures are very dated and furniture and building could use an update. Outside is in need of fixing, but totally understandable do to the hurricane. Pool and deck were excellent. Overall the property was clean and the staff was very friendly. Watching the sunrise every morning with a cup of coffee as the charter boats left the marina was nice. The only two negatives were it was across the street from a firehouse and there was a lot of activity the weekend we were there. The other was there were some screws on the deck that could be repaired. I stepped on one and it wasn’t very pleasant. The pool area had 2 grills and plenty of seating along with a little bar area. Great for entertaining by the pool and getting to meet the other guests. Would definitely recommend to others. The front of the building is a bit of a disappointment but, when you look out the sliding glass window that view completely makes up for it. The house was clean and we felt at home. Love Key West. Light & noise from traffic but it dies down around midnight. Parking was tight but always available. 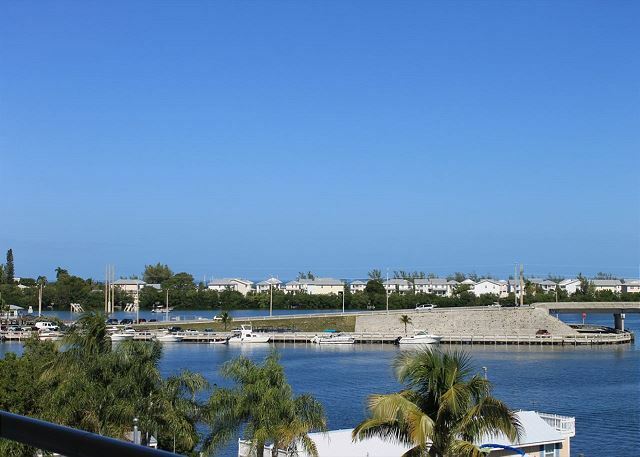 The condo is located close to grocery, restaurants and the public marina but is a bit of a walk to some of the popular beaches and attractions. Driving the short distance was not a problem. The unit was spacious and clean. The building is older but the unit was updated and perfect for our family. The kids had their own room with a TV and en suite bathroom which they loved. We spent a lot of time on the spacious balcony overlooking the marina. We also had direct access to the pool from the balcony which was a great feature. The concierge Ashley reached out to me upon booking and was very helpful. She booked our trip to the Dry Tortugas which I highly recommend! This condo was great - it was clean, check in was easy, the staff was wonderful, the pool was warm, no complaints about the accommodations I would definitely recommend. It's probably a 15 - 20 minute walk from Duval so if you're not able to walk and aren't willing to uber this might not be the best place for you. We enjoyed a wonderful week in the Abaco Retreat at Pelican Landing! The condo was spacious enough for our family of 5 and everything was immaculate when we arrived. We enjoyed the warm pool every day and especially in the evening under the stars. 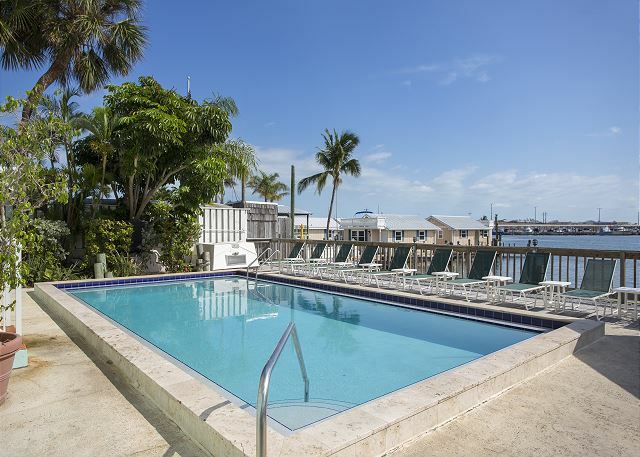 The location was wonderful for easy access to grocery stores, a short drive to Smathers and Higgs beaches and a lovely walk along Key West's picturesque streets to enjoy the fun on Duval Street and the Sunset Festival at Mallory Square. A perfect vacation property for our February break in Florida. We'll definitely be back next year! Property was in a very easy to find location, close enough to everything (quick drive, bike ride, or even walking). Great patio area for relaxing before/after going to Duval street, etc. Spacious kitchen and living room area (which we never used due to being on the patio). Place was very clean and late check-in was easy. Staff was accommodating and friendly. Wonderful, best experience in long time. Everything was perfect. we were near the beaches and far away from noises. Just enjoyed a weekend stay at Pelican Landing in Key West to do some winter fishing. We have stayed here before and it's always been a great experience. Definitely recommend this property if you are traveling to Key West by personal boat. Jamie and her staff are professional and extremely friendly. We love that this a quiet, secure, family friendly spot. Not for partiers! We had a great experience, we loved staying there, spent each morning and evening out on the deck, watching the boats and water. Very clean, comfortable beds. I believe this was our 5th or 6th year in a row staying at Pelican Landings for an annual family fishing trip and every year it is great. The rooms are always in great condition with all the amenities needed. This location has a great "family" atmosphere, so if you're looking for frat house loud partying place, this ain't it. Jaime, Alexandria & Arnold go out of their way to make sure you have an enjoyable stay and have what you need during your stay. Condo was clean and nicely furnished. View of the marina from the deck is great, watching the fishing boats come and go. Location was quiet, but convenient to all of the attractions of Key West. Overall experience was great. Really nice outdoor amenities (pool, deck, boat dock), as well as relaxing patio. We spent most of the time outside on the patio enjoying the view. We slept 6 people without any issues at all. Management made the experience very easy to book. Location is a bit far to walk with children to most activities in the tourist areas, but becomes a 5 minute drive in the car. Bringing a bike (or renting a bike) would have made this a non-issue. Having used Pelican Landing for the last twelve years I can say that it the best value accommodation in Key West. Further more if fishing is your holiday priority I doubt if you will find a better location in the lower keys. I am part of a group from the UK and have recommended several friends to use the Pelican Landing facilities and everyone has always had a good time. Our stay at the Pelican Landing Abaco Retreat was nothing less that wonderful, everything was so clean when we arrived...would definitely stay again ! The apartment was very nice and in a great area, within walking distance to Duval Street. One observation we had during our stay is that it could do with new pillows and bedding and that table mats for the lovely wooden table would be nice. The rugs in the living room and front bedroom could do with a clean too. These are small and inexpensive fixes in our opinion, but would go a long way. And we would definitely stay here again. This being my first visit to Key West I wasn't sure of location or rentals in general . That being said everything was extremely pleasurable , only a short walk or cab ride from Duval . The unit was in very good condition . We had a small problem on first day and just called office and they sent someone within 5 minutes to check on problem ( which was taken care of ASAP ). I will definitely be returning in years to come and will put your property first on my list . Condo was spotless. It is exactly as pictured online. There were some stains on chairs and sofa, but nothing out of the ordinary as you are renting to varied individuals. You enter building through the parking garage. Elevator was dirty and smelly. Security was very good. Key to enter elevator and stairwell. One big drawback personally was there were not two wicker chairs on deck as shown. We would have liked to sit outside with cocktails and watch boats. But, overall, we would recommend this condo for the cleanliness alone. 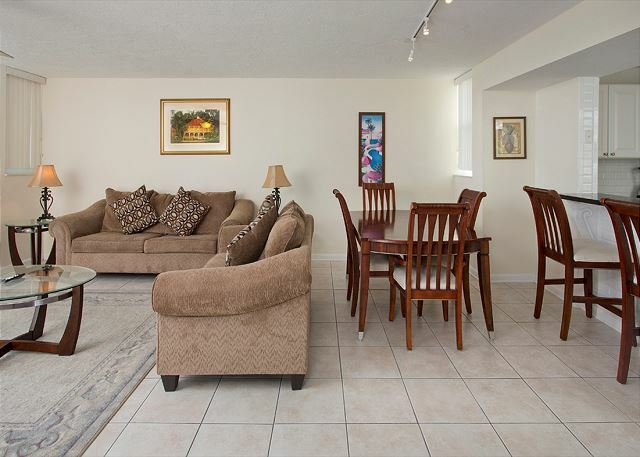 We rented out this condo during our stay in Key West, and we were extremely pleased with both the location and the quality of the accommodations. The rooms were spacious and nicely decorated. The area seemed relatively safe and was within walking distance (20-30 minutes) of the more popular areas of the island. The only downside was that they have a very stringent age restriction which seems overly harsh and does not seem entirely sensible. We were traveling with a group of individuals in our 20's. Only one of our group was under 25 (she is 24), but the property manager refused to let us reserve the property for her to stay with us. She had to rent another property separately that was much more expensive and less desirable. Our group was all responsible adults. We were very disappointed that the property manager was unwilling to compromise on this restriction. We booked this unit last minute and overall were very pleased. The response rate was awesome and the unit was spacious. The furniture is getting just a bit worn, but it was a value for what you get. The deck was awesome and the view of the marina was really pretty! The furniture on the deck was in poor repair but did the job. The Abaco was described to me as one of the more modern units with newer kitchen appliances. The unit is spacious and the property is very quiet and peaceful - management seems to put a premium on ensuring that there are no "Spring Break party types" staying on the property. However, the living room furniture could definitely use a thorough cleaning - lots of spots and discoloration. The bedroom furniture is a bit dated, but passable. The inside of the unit looks a lot better than the outside - peeling paint and a dirty parking area which is not well-lit. Not a resort, but better than a noisy, cramped hotel. Convenient location to restaurants, stores, Duval St, etc. (Key West is not a large island). Excellent overall! Minor problems with the curtains,couldn't close them!! The property was as described. It was too cool out to use the pool so can not say much about that. The exterior of the building was in some disrepair but the rooms we had were very nice. They were clean and had everything we needed in the kitchen. Even had dish soap and laundry soap to use.We have no complaints and would stay there again. It is about a 20-30 minute walk to Duval street and twice that to Mallory Square.We walked it daily and enjoyed seeing the different houses as we would take a different street every time. Good vacation but an average condo. I had a problem with broken furniture in the house. The kitchen chairs were held together with zip ties and the sleeper sofa was missing numerous springs. Preventing us from sleeping on it. That resulted in one of the guest trying to sleep on a uncomfortable couch. 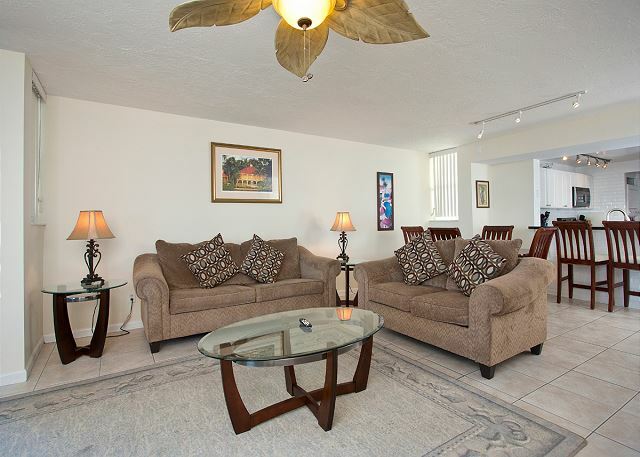 Older but well-maintained property, room was nicely remodeled with plenty of space. A great place to stay in Key West! Our place was right as you get into Key West and we walked into a beautiful condo! It was clean and airy with beautiful decor. There was so much room in the condo also, you never felt crowded and we had 6 people plus a small dog. Parking was no problem ever and we were very thankful for the elevator and also that it was dog-friendly with a small fee. We were close enough to everything and rented bikes to get around. The staff was very professional and always helpful. Very "chilled" place to stay. I would stay here again and recommend it to friends and family. It was just for one night but it was perfect. plenty of parking and the condo was spacious. Great location and spacious room for a fun birthday celebration weekend. Sure to come back soon! The room was very nice and comfortable, the porch out back was huge and the view of the water and boats was amazing. It was very relaxing. The walk to Duval street was a little long but we took a cab a few nights for only $10. We had a great time and would definetely recommend this room to a family as there was lots of room for all of us! Hello Tamara, Glad you enjoyed your stay. Hope to have you stay with us again. We stayed here during Fantasy Fest. It was a little to far from Duval St. to walk back and forth more than once a day. But it was far enough from Duval St. to be quiet and restful. Our first condo was extremely nice, but the larger one could use some maintenance. However, overall it was a very pleasant place to hold a reunion with plenty of room for all and lots of conversation and gathering areas. Everything was as promised , great location , very nice and helpful staff . We just returned from a lovely stay at Pelican Landing. I was very happy with the residence,very appropriate for a month's stay. The room was so spacious! It was also very clean, you can tell they keep the property up nicely. We had a great time at Pelican Landing. Hello Eric, Glad you enjoyed your stay, hope to see you and your family again soon. Very enjoyable time. The condo was very nice. View of the water is great. Pool did not get much sun so did not get to use it but maybe next time. The condo at Pelican Landing was awesome! Perfect location, close enough to Duval and right on the water with a very convenient spot to park my boat. I will definitely stay again and recommend to anyone looking for a great, clean, updated place with water views and access. Overall the place was enjoyable, great location for boating, pool and its amenities are perfect. The unit we stayed did not have properly equipped kitchen, which was very unpleasant...Come to find out, the unit was in foreclosure - This shouludhave been disclosed at time of booking! Other than that, we enjoyed our stay and we will return next year, hopefully to a non-foreclosure unit.